The Thanksgiving Parade is almost here! Some people anticipate this event just as much as the Superbowl. Just about every other household will be watching the parade as they prep for the evenings big event. The parade balloons have become iconic. Some of them are Thanksgiving traditions in their own right. Some people even have attending the parade on their bucket list. Just like game day, parade day warrants some yummy snacks! You may not want them to be too fussy or heavy because you have a lot of eating on the horizon. Here are some of my favorite snacks for watching your favorite event! You are going to be so busy prepping turkey that being able to rely on a delicious snack that is ready to go is key! What is great about Pirate’s Booty is that it is baked and never fried, gluten free, and made without any artificial colors, flavors or preservatives. The only problem is, it will probably be gobbled up in a flash, no pun intended! One of the easiest and versatile snacks to make is crostini. You can use your imagination to make the perfect bite size combination. This just sits on top of a great piece of bread ready to be popped into your mouth! While watching parade, I would keep it on the lighter side. 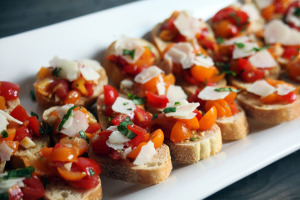 Maybe try a classic Cherry Tomato Bruschetta. Or something on the sweeter side with Gorgonzola and Pear. 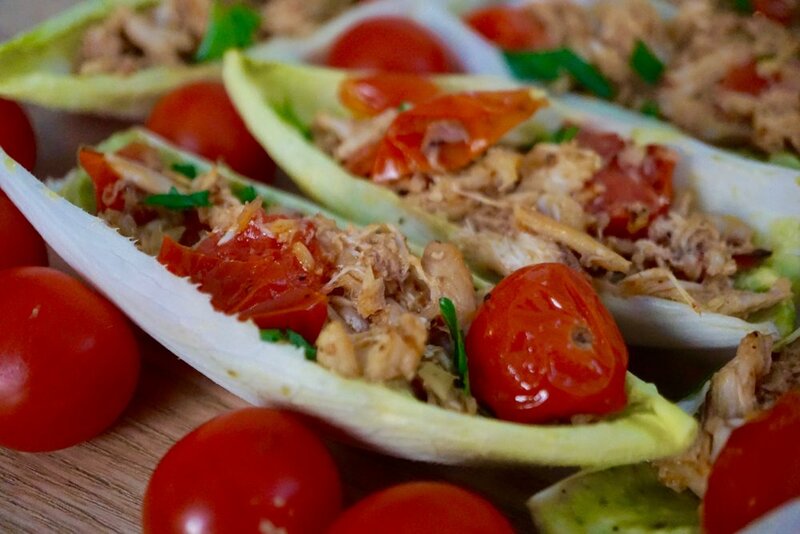 If you are really want to lighten things up use endive. Endive can be a great base for many different ingredients. The recipe below features crab claw meat sautéed quickly with cherry tomatoes. The whole dish took me 15 minutes to put together. I always encourage the use of paper plates. For a smaller crowd, sometimes it’s fun to use appetizer plates. They add a pop of color to the table and instantly makes things a little bit more elegant if you will. 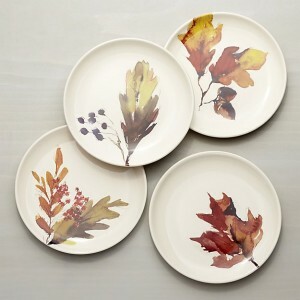 I recently found these Autumn Foliage plates at Crate and Barrel and fell in love with them. They struck me as different from some of the other Thanksgiving themed tableware you find. This post is done in partnership with Pirate’s Booty. All opinions and recipes are my own. Heat the olive oil in a large saute pan over medium to low heat. Add the shallots and saute for 2 minutes then add the cherry tomatoes. Let the cherry tomatoes saute, moving around the pan periodically. When they start to blister and open (about 5 minutes) add the butter to pan. Once the butter is melted add the crab meat. Add in salt and pepper to taste. Saute until crab meat is warmed through, about 2-3 minutes. Add lemon juice and stir again. Arrange the endive leaves on the plate. Top with a small spoonful of the crab and tomato mixture.